The scholarship imbroglio which has surrounded the Johnson campaign has been reported quite thoroughly by the Dallas Morning News – except for shocking oversights and omissions which the DMN could have remedied simply by consulting its own archives. Doing so would have quickly revealed that Congresswoman Johnson’s shameful exploitation of the Congressional Black Caucus’s scholarship program is but one instance in a pattern, several decades old, of the Congresswoman treating the powers and privileges of public office as private resources to be manipulated for personal gain and aggrandizement. Consider, for instance, a Morning News story published on 10/13/2010, revealing that one of the improper scholarships EBJ awarded in 2007 was to the daughter of D/FW Airport Vice president Don O’Bannon. Since Mr. O’Bannon oversees minority contracting at D/FW, and since EBJ owns 25% of two newsstands at D/FW which she acquired under the auspices of minority contracting programs, her steering scholarships to Mr. O’Bannon’s daughter reeks of impropriety and conflicts of interest. It is difficult to avoid the conclusion that EBJ, entrusted with oversight of the Black Caucus’ scholarship program, abused that trust in order to massage her business relationships. This revelation is troubling enough on its own merits. It becomes significantly more so, however, given that EBJ gained entry to the airport newsstand business under shady circumstances which also suggest exploitation of her office for personal gain. As the Dallas Morning News reported on August 12, 1988, EBJ was awarded a newsstand concession contract potentially worth $4.5 million over 5 years, despite the fact that her application was incomplete, and that other local businessmen whose applications were complete, and who had significant concessions experience, were rejected in favor of EBJ. “The requirements include names of references; a balance sheet prepared by an independent certified public accountant; a chart of the proposed business organization; resumes of proposed operators and managers; and a list of past or present retail or newsstand operations. EBJ claimed that her experience as an executive assistant at Neiman Marcus qualified her to operate the concessions in question. But, as the Morning News reported on May 1, 1989, EBJ’s newsstands significantly underperformed sales projections established by the contractor, Host International, despite the fact that other operators selected to work on the same program with Host were on track to meet or even exceed Host’s sales projections. What’s more, EBJ’s stores were plagued by numerous managerial and administrative difficulties, including high turnover, cash shortfalls that caused two newspapers to suspend delivery, and repeated failures to stay open during the hours that the Host contract required. It would appear that the allegations of EBJ’s insufficient qualifications, made by more qualified applicants passed over in her favor, were borne out by the poor performance of the newsstands under her supervision. But why, one could ask, would D/FW Airport and Host select EBJ as a subcontractor, despite her minimal credentials? Two reasons. One is that, as the Morning News reported on July 6, 1988, the airport’s selection of Host to manage concessions had provoked heated political controversy over allegations had the company had a poor record in achieving acceptable rates of minority participation. In response, Host vowed to almost double the minority contracting rates which its contract with D/FW stipulated. What’s more, the airport was generating similar controversies regarding its poor record of minority contracting participation, as the Morning News reported on Aug 1 and August 3 of 1988 – just days before the suspicious contract was offered to EBJ. And, as the Morning News reported on July 5, 1987 D/FW was still recovering from controversy surrounding the 1986 appointment of Oris Dunham as Executive Director, instead of Acting Director Vernell Sturns, an African-American. Given the potentially disastrous consequences which ongoing controversy about minority contracting threatened to Host and D/FW, both parties stood in need of political protection above and beyond that provided by promises of increased minority contracting. What better source of such protection than an alliance with Eddie Bernice Johnson, a well-connected state Senator who the Morning News had described, in an article published on July 5, 1987, as an influential member of new generation of local black leaders? None better, apparently. The need for political cover led D/FW to dispense with its own internal application vetting procedures at the direction of Mr. Dunham, as reported by the Morning News on August 13, 1988. Had he not done so, EBJ’s application would have been automatically rejected by the administrator. The upshot? By leveraging political connections and the needs of Host International and D/FW Airport Director for political protection, EBJ managed to acquire lucrative vending contracts that rightfully should have gone to other, more qualified members of the minority community, of which she is purportedly a leader, and whose interests she claims to champion. And 20 years later, she shamelessly exploited a scholarship program entrusted to her care for the purpose of strengthening her personal business interests, again at the expense of deserving members of the minority community the scholarship program was created to serve. Something to ponder: Having gained entry into the airport concessions business under such shady circumstances, and with the ongoing political clout to remain in said business despite lacking the necessary skills and qualifications in the beginning, has EBJ done well for herself in exploiting the vending contracts her constituents deserved? According to Dallas Morning News reports dated September 7, 2010, very well indeed. Good for her. For her constituents, not so much. 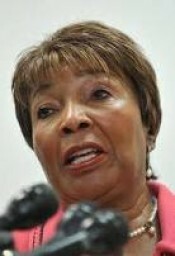 Read "The Improprieties of Eddie Bernice Johnson, Part 2" here.